So I made some cookies last week. And I might end up making them every week for the rest of my life. 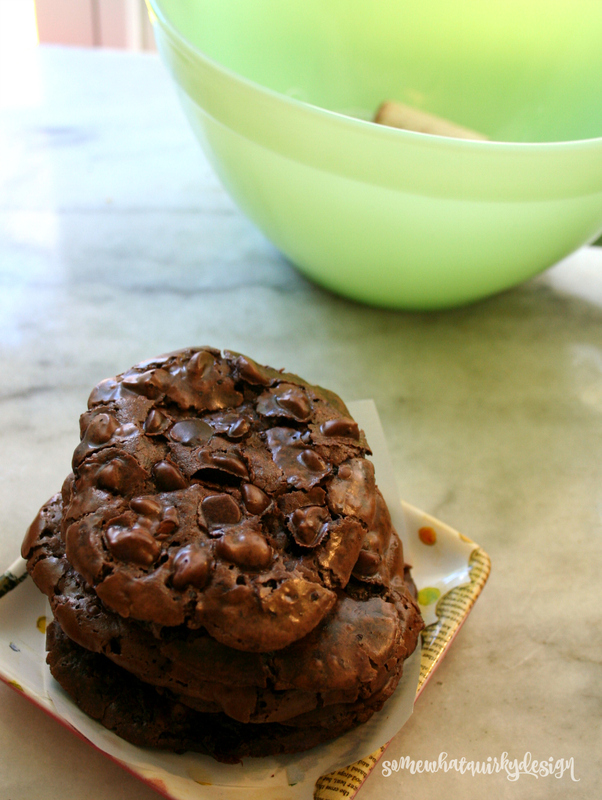 I ended up using a recipe from Mamagormand called Chewy, Fudgy Flourless Chocolate Cookies. She said she had been making the recipe most of her life. 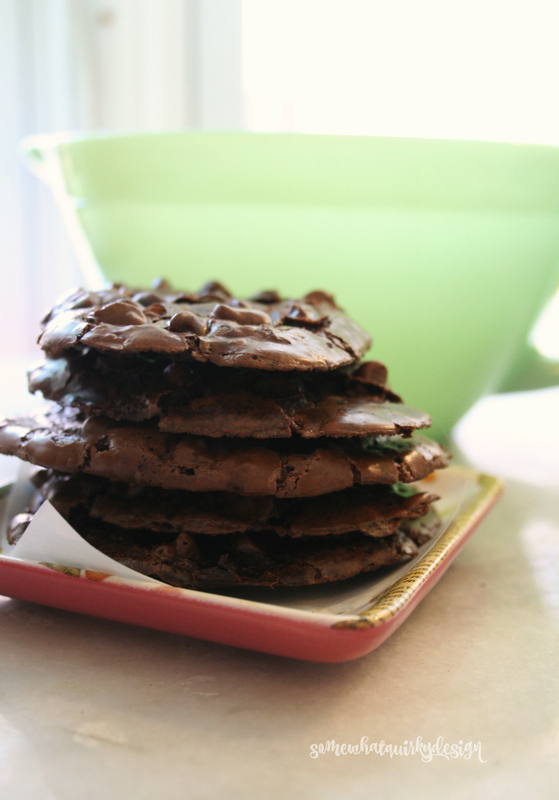 The recipe she uses is quite similar to this recipe for Flourless Fudge Cookies from, surprisingly and ironically, the King Arthur Flour website. I found other similar recipes here, here, here and here. They are all very similar but they all vary on what the add-in should be - chocolate chips, pecans, walnuts, or any combination of chips and nuts. Did I mention that these cookies are delicious? They taste like the crusty, fudgy 1/3 of a gooey brownie. I typically prefer my desserts singularly - like just cookies, just ice cream, or just cake. But the four of us taste testing these all agreed that these cookies were just made to be served with vanilla ice cream. 1. Cover cookie sheets with parchment paper (I used three sheets) spray with non-stick cooking spray. I used butter for this - just spread it all over the paper. Set aside. 2. Wisk sugar, cocoa, salt in a bowl. In a separate bowl lightly wisk egg whites and vanilla. Stir wet ingredients into dry mixture until incorporated. 4. Spoon onto parchment lined cookie sheets. You should have about 24 cookies. Be sure to leave enough space between cookies for them to spread. 5. Set cookies aside. Let set for 30 minutes. Set oven to 350. 6. Bake cookies for approximately 10 minutes - less for smaller cookies, more for larger cookies. 7 Let cookies cool for a bit before moving to cooling rack. 1. Buy some Dutch process cocoa. There is a difference between natural cocoa (Hershey) and Dutch process. It's an acid thing. So if your recipe has any leavening in it you must use the specific type they call for in the recipe. Here is a great article about it that is easy to understand. 3. If you have a difficult time getting the cookie off the paper, put it back in the oven for a bit. You don't have to turn the oven back on. Just get it exposed to the warm air for a while. The cookies should come off easily after that. 4. Leave the cookies out in the air for several minutes to let the cookies firm up. I left them out overnight. They stay soft and chewy on the inside. 5. 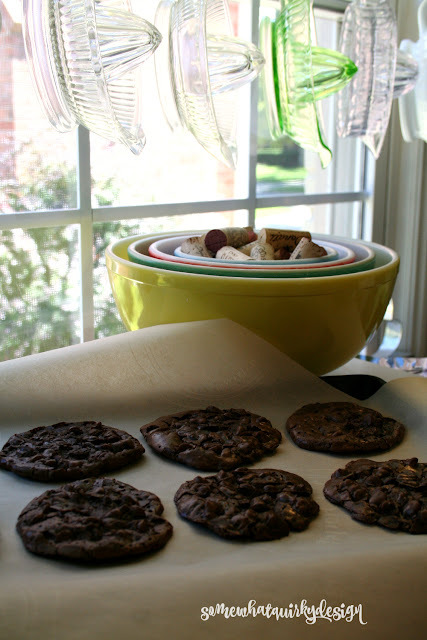 If you are stacking the cookies, use parchment paper between them. Why aren't you on the way to the store? I made this recipe again without chocolate chips and with the same amount of toasted walnuts. They were delicious. I'd love to compare them side by side, because it seemed as if the walnut ones tasted just as good and chocolaty as the ones with the chips. So if you want a slightly - actually MUCH - healthier version, make them with walnuts and no chips. There is some certifiable nutrition in them if you use this version.